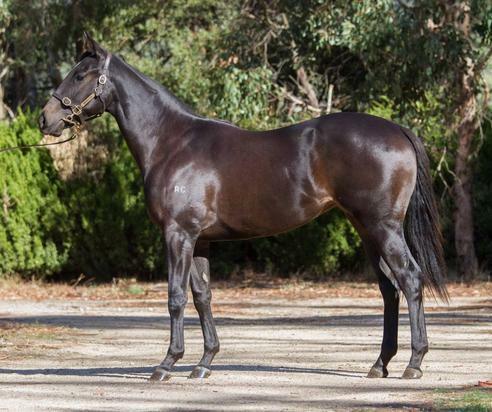 Introducing Lot 214 from the 2018 Melbourne Vobis Gold Yearling Sale. A lovely filly by impressive sire BRAZEN BEAU. Please don't hesitate to contact Colin on 0417 310 249 for further details. Dehere's the Love (g. by Dehere). 5 wins at 1200m, HK$4,672,425, HKJC Sha Tin Wai H., Mody H., Coloane H., Hung Hom H., Hadatuko H., 2d HKJC Kowloon City H., Kau Sai Chau H., South Wall H., Carnarvon H., 3d HKJC Lung Kong H., Kranji H., Mei Tung H., Lung Mun Road H., IWC H.
Karratha Coast (f. by Commands). 2 wins at 1200m, 1450m in Aust. and Philippines. Duchess Darla (f. by Duke of Marmalade). Winner at 1200m in 2017-18 in Aust. Testa Reale (Testa Rossa). Winner. See above. Royal Bender (Refuse to Bend). 6 wins-3 at 2-to 1200m, A$407,762, VRC AFL Life Members & Carbine Club 2YO H., MRC Premier Signs H., Responsible Gambling Awareness Week H., Bianco Flyer 2YO H., Sportingbet H., 2d MRC Sir John Monash S., L, BRC Lightning H., L, MVRC Sportingbet H., Programmed Property Services H., MRC Geoff Murphy H., VRC Veolia Environmental Services H., SAJC Boag's Draught H., MRC Race-Tech H., 3d SAJC WH Wylie H., L, MVRC Essendon Mazda 55 Second Challenge Heat H., Essendon Mazda 55 Second Heat Challenge H.
Another Bender. 6 wins to 1400m, A$85,298, to 2017-18 in Aust. Winged Foot. 3 wins at 1200m, 1300m to 2018 in Malaysia. Dash of Class. 2 wins at 1000m, 1200m, Singapore TC Magic Millions National Yearling Sale 2YO S., Open 2YO S., 4th Singapore TC Juvenile Championship, L.
Imperial Attitude. 3 wins to 1100m to 2016-17 in Aust. Red Corner. 6 wins to 1400m, A$147,135, VRC National Jockeys Trust Series Heat H., MRC Le Pine Funerals H., Dandenong Southern Stingrays H., 2d MRC Le Pine Funerals H., 3d MRC Le Pine Funerals H.
Barton Bank. 2 wins at 1200m, 1400m in Aust. Rubambi. 2 wins at 1200m, 1300m, 3d VRC Rashlore H.
Rustic Debutante. 4 wins to 1300m to 2017-18 in Aust. Rush of Blood. 3 wins from 1400m to 1700m to 2016-17 in Aust. NULLABOR (Military Plume). 7 wins-1 at 2-from 1000m to 1600m, A$152,945, WATC Ascot S., L, Rentokil Healthcare H., Ascot H., Temple Coyn Welter H., Sunday Good Times Welter H., February H., 2d WATC Aquanita S., L, BATC Brisbane News H., WATC Commonwealth H., Qantas Australia Holidays H., Gest Lemonade H., Japan Racing Association Welter H., Fred Carden H., 3d WATC Easter S., Gr.3, Ngawyni S., L.
IP MAN - EL PADRINO (Sing.) (Mr. Nancho). Champion Older Horse in Singapore in 2014. 10 wins to 1400m, S$836,282, K$221,500,000, 609,220Dhs in Singapore, Korea and U.A.E, Singapore TC Merlion Trophy, L-twice, Woodlands H., L, Seoul SBS Asia Challenge Cup, Meydan Saeed & Mohammed Al Naboodah Group H., Singapore TC Korea Racing Authority Trophy, Fatkid S., 2d Singapore TC Merlion Trophy, L, Seoul SBS Asia Challenge Cup, Singapore TC Kranji A S.-twice, Open H.-twice, 3d Singapore TC Kranji Sprint, L, 4th Meydan Dubai Golden Shaheen, Gr.1, Singapore TC Lion City Cup, L.